Most people say they fear getting Alzheimer’s disease more than they fear heart disease, stroke, diabetes, or cancer, according to a number of recent polls. And a large number even fear it more than dying. And the odds of that fear being realized seem scary, too. The Alzheimer’s Association posts the statistics that an estimated 5.4 million Americans were living with the debilitating disease in 2016. And that every 66 seconds, another person in this country develops it. Given that fear and prevalence, there’s another tough truth that no one wants to hear: There is currently no drug to cure the condition. Despite that reality, hundreds of thousands of people with Alzheimer’s and other forms of dementia are “treated” with antipsychotic drugs. A large percentage of them live in nursing homes, where the drugs are routinely doled out to sedate and subdue residents the nursing staff has labeled as problematic or uncooperative. The drugging practice blatantly disregards laws promising nursing home residents rights and protections. A sweeping reform enacted decades ago, the Nursing Home Reform Act of 1987, created a Residents’ Bill of Rights and required nursing homes to offer compassionate care in homelike settings. It also mandated that facilities “provide services to attain or maintain the highest practicable physical, mental, and psychosocial well-being of each resident.” And the kicker: All drugs administered were to “meet the needs of each resident”—and antipsychotics, in particular, had to be carefully monitored and given only as a last resort. Nearly 30 years after the legislation was passed, most consumer advocates lament the law has had little effect. Far from being homelike, the grand majority of facilities still more closely resemble hospitals, with centralized nurses’ stations surrounded by warrens of impersonally appointed rooms shared by several residents. Most troubling, anti-psychotics are still administered in alarming doses with a dangerous lack of oversight—the polar opposite of the elevated promises. That’s not hyperbolic. As CMS itself acknowledged in the preamble to the new rules proposed: two-thirds of the people dying with dementia die in nursing homes. Jonathan M. Evans, a geriatric specialist and medical director of two long-term care facilities in Virginia, has been an outspoken critic of the practice of prescribing psychotropic drugs, offering Senate testimony condemning it. In a recent lecture titled “Understanding and Approaching Challenging Behaviors in Dementia,” Evans emphasized to a crowd of health care professionals that most caregivers make the cardinal mistake of trying to “reason away” the challenging behaviors that many people with dementia present. It’s usually a waste of breath. But the caregivers complained that one of their biggest challenges is that people with dementia often passively or actively resist care. Looking at this as a problem that can’t be drugged away requires embracing the perspective of the person afflicted with dementia, who is likely to feel threatened by another person’s attempts to help with feeding, dressing, bathing, or administering medicine. The natural human reflex is to resist, to feel that it may be an assault. Avoid surprising people who don’t like surprises. Communicate at eye level or lower; avoid standing over people, which can feel threatening. Talk in a slow, calm, reassuring voice. If care is met with resistance, stop and try again later. Get the person to participate—such as by holding the toothbrush or hairbrush—instead of doing the actions to and for them. 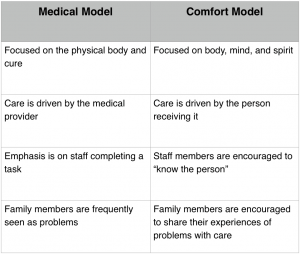 Geriatric experts and consumer advocates agree that what’s needed has long been urged: a revolution in the care offered at nursing homes—moving from a “medical model” to a “comfort model” focused on the needs of individual residents. In debates over this change, meanings often become muzzy. Tena Alonzo, Director of Education and Research at Beatitudes, a care program for older adults with dementia, offers a concise illustration contrasting the two types of care and attitudes behind them. 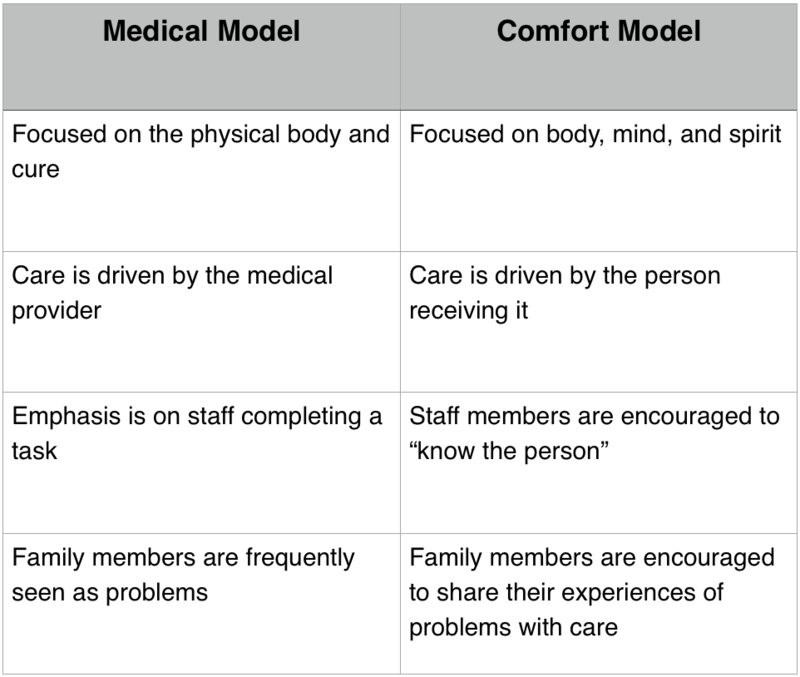 In the comfort model, instead of administering a dulling drug, nursing home staff are encouraged to look at why the person with dementia is acting “unacceptably,” usually as a natural response to an unmet need. Underlying the behavior may be pain, anger, fear, boredom, frustration, loneliness, confusion, sadness—any of the “normal human emotions” that may not be clearly expressed. But countless studies show that nursing homes relying on anti-psychotics are invariably understaffed, and the nursing staff they do have is poorly trained nursing in dealing with residents with dementia. To bring about the revolution, care facilities need more staff with better training. But the culture is entrenched and has mostly resisted these changes. Perhaps repeating the pleas will make them stick. For example, a relatively little known provision of The Affordable Care Act of 2010 requires that the Centers for Medicare and Medicaid Services (CMS) must ensure that nursing home aides receive regular training on caring for residents with dementia and on preventing abuse. The impact of that mandate is still unclear. For now, interested family members and friends can educate themselves on kinder, gentler ways to care for those with dementia—and urge changes for those cared for in nursing homes. A number of free resources provide good guidance. Encouraging Comfort Care: A Guide for Families of People with Dementia Living in Care Facilities. This booklet is filled with accessible information to help track and monitor the progression of dementia, tips for working with nursing home personnel, and guidance in making medical decisions for and with the resident. Massachusetts Senior Care Foundation. This curriculum and training, complete with Power Points and videos, developed by a geriatric psychiatrist, helps equip nursing home staff with the knowledge, skills, and attitudes to meet the needs of residents with dementia using approaches other than medication. Much of the information offered, such as a fact sheet on “Ten Tips for Talking With a Person With Dementia,” is also invaluable for family members and friends involved in caring for a person with dementia. Hand in Hand: Training Series for Nursing Homes. Offered by CMS, this toolkit emphasizes “person-centered care”—requiring that doctors, nurses, social workers, and other caregivers take the time to get to know individual patients and their preferences. For more on the perils and reality of drug treatments in nursing homes, see Nursing Home Residents With Alzheimer’s: Drugged to Death. Nursing Home Residents With Alzheimer’s: Drugged to Death? Senior Grazing – Through the Food Trucks!